Nepal is, without a doubt, a beautiful country. 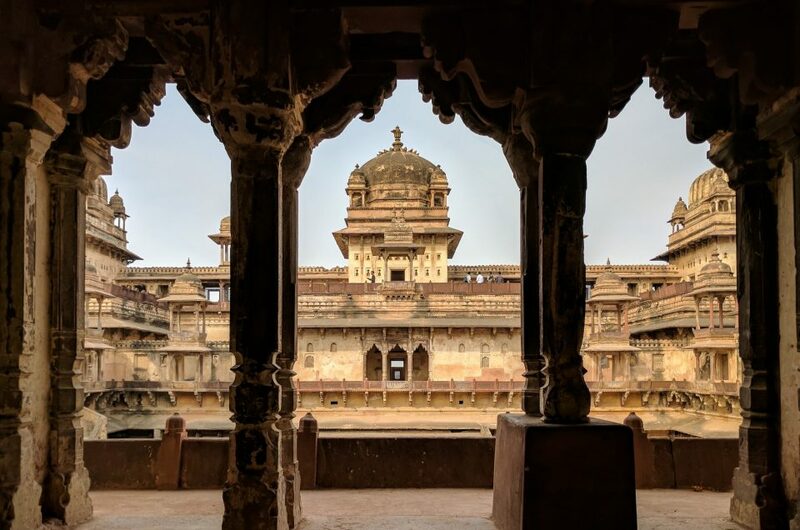 From the buzzing streets of Kathmandu to the peace of the solitary monasteries in the mountains the beauty of the landscape and architecture is omnipresent. However, the Himalayas are something completely different. This is the top of the World. 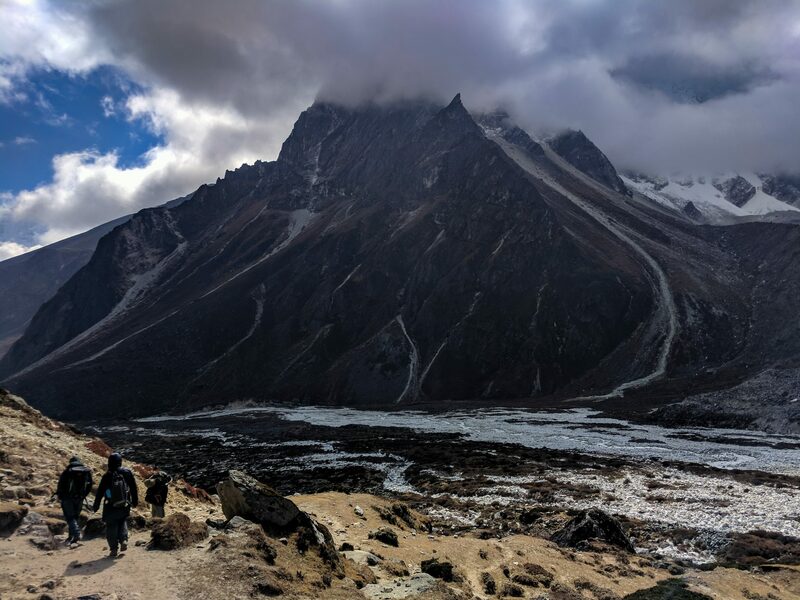 In the EBC trek, you will be surrounded by some of the highest peaks of the world. The wonderful vistas can only be described as breathtaking. At the beginning of the trip, near Lukla, the landscape is dominated by green forests and rivers with crystal clear water running down the mountains. With every new day you go higher, and everything around changes. Soon the forests will become brown and yellow plains. The snowy peaks in the background will tower over the huge valleys. Finally, all vegetation disappears and everything becomes white and grey. Ice and rock, the two only things you will see over 5000 meters. Nepal has, in my opinion, a unique and fascinating culture. You can explore the country for months and discover something new every day. 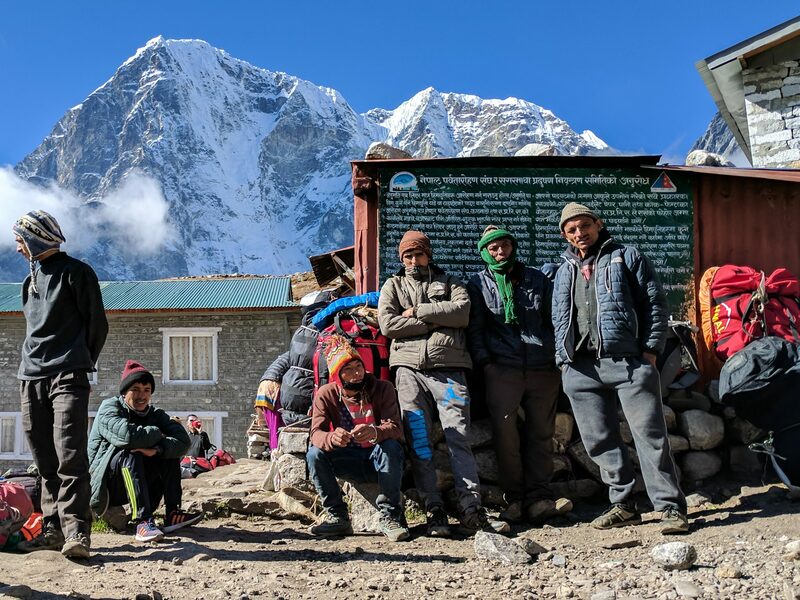 The Sherpas in the EBC Trek are no exception. While trekking is definitely a big part of the experience, it’s not the only thing you can do. After all, you will walk on average between 6 and 8 hours a day. There’s plenty of things to do! Especially at the beginning, in villages like Lukla or Namche. The last one is especially good. 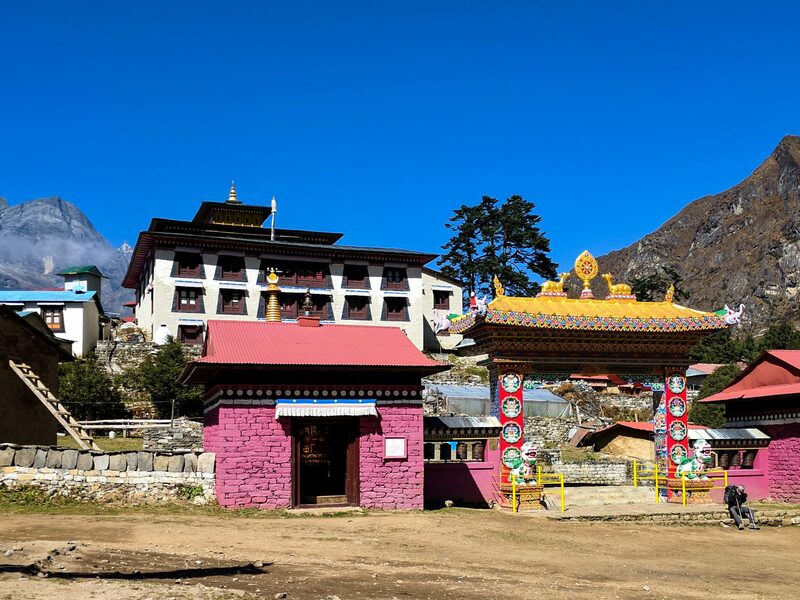 In Namche, you can go to the Everest museum and learn more about the history of the region. Or maybe go to the local market, the biggest in the area, and get a small trinket as a souvenir. Or just walk around the streets watching the local life. 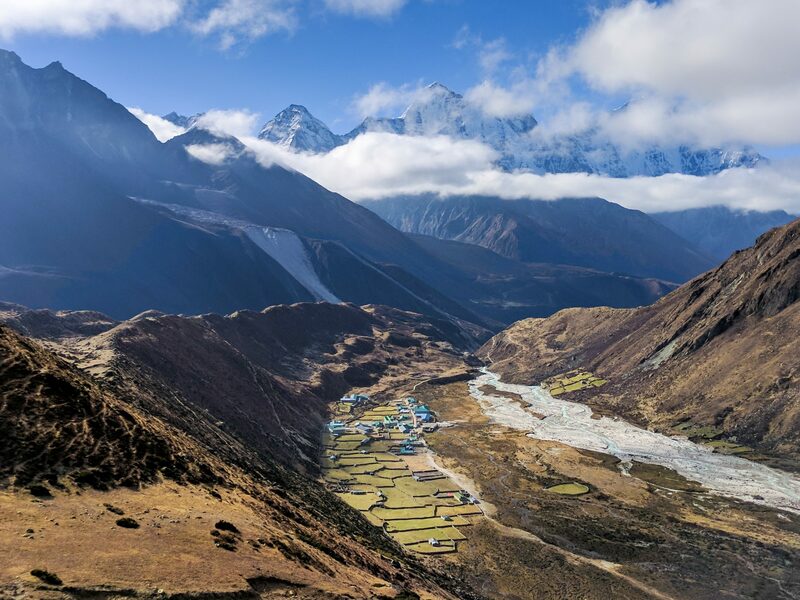 Along the way, there are more opportunities to learn about the culture of the Sherpa people. You will quickly notice the stones with inscriptions in Sanskrit. These, carved by monks, are very important for the religious people. As a sign of respect, you must always walk around them, making sure they are on your right side. 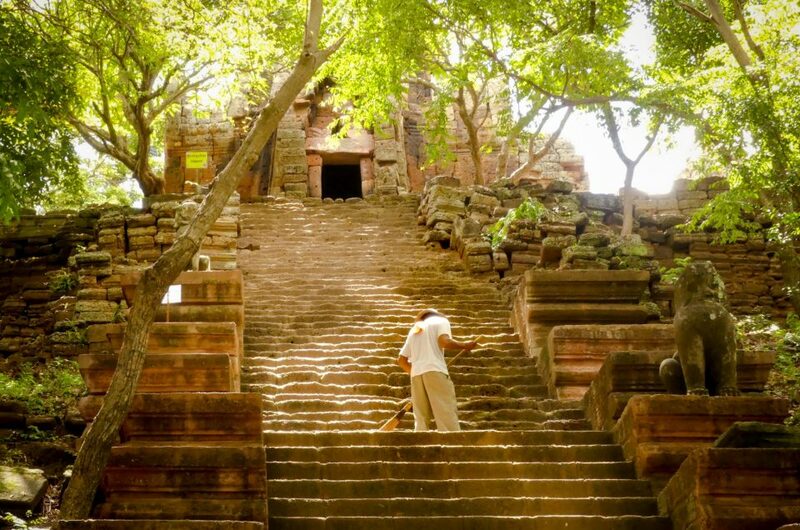 This is a pretty common concept in Buddhism, where, for instance, you have to walk around temples in a clockwise way, leaving the central statue at our right. Oh, and if you see locals not doing it, it might be because they follow another religion! Nepal is the meeting point of Buddhism and Hinduism after all. Another great opportunity to learn more about the culture and religion of Nepal is the Tengboche Monastery. It’s a beautiful Buddhist monastery located near Panboche, a small village that people usually reach on the 4th day of trekking. You can get inside and have a look, but remember taking photos is strictly forbidden and a very disrespectful! 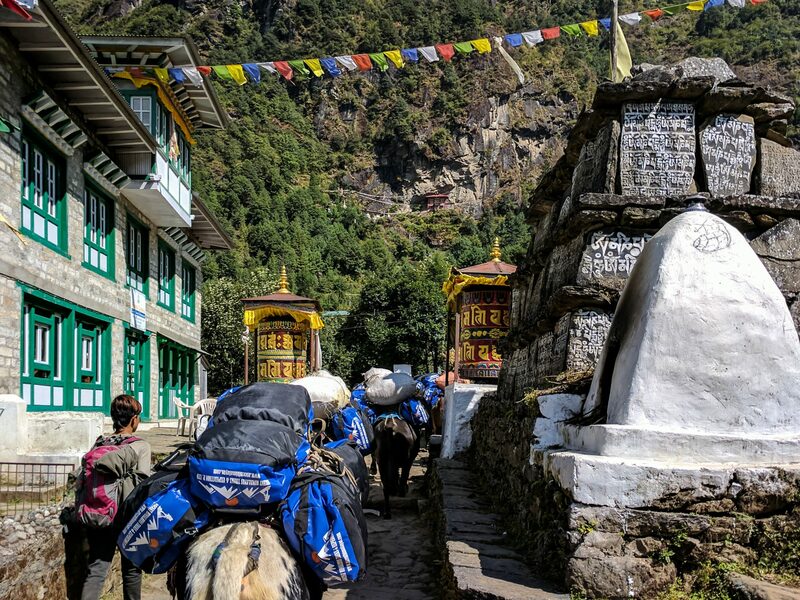 Let’s face it, hiking all the way from Lukla to Everest Base Camp is not easy. While Sherpas makes it look like a walk in the park, it’s a very challenging and intense experience. You will hike for many hours every day, running out of breath constantly, fighting the elevation. For a week and a half, your daily schedule is going to consist of early mornings, long walks, quick meals and resting in a teahouse in the evening. The last days are going to be very, very cold, and every step is going to be hard. Often, people will have to return via helicopter due to altitude sickness, and even sleeping can be hard when you can’t breathe properly. The reward of days of hard work! However, none of this matters when you reach Base Camp. The feeling of accomplishment is amazing, finally reaching the mountain you could barely see the first days in the distance. When I did it it didn’t matter how hard, challenging and cold the previous days were. I just knew I did it. I finally did it, and nothing can take that away from you. Not only that, even each small step is a reward in itself. Every time you finally reach our destination for the day, every small hill you conquer, even if you have to go downhill again for a while. Everything adds up. Once the whole trek is done you feel renovated and full of confidence like you are the king of the World. This is probably one of the main reasons why so many people go there. There a lot of beautiful treks in Nepal, and there might be even more beautiful. There are lots of mountains in the Himalayas, many of them over 8,000 meters as well. However, none of this matters. Because Mount Everest is Mount Everest. The top of the World. The highest peak. And how many chances in your life do you have to do something like this? To get so close to the highest point on Earth? I still remember the first time I saw it between the trees on my way to Namche, and I will never forget it! These people have always been praised by travellers and explorers that go to the area. Their reputation as loyal, friendly, determined, hardworking and able to incredibly athletic feats is well earned. While you can do the trek on your own, I definitely recommend hiring a sherpa. It is going to be more expensive, but it’s a money well invested. Not only he will help you along the way, you also have the unique opportunity to ask him whatever you want to know. The Sherpa I hired, Lakpa, was not just a guide. After 10 days he became a friend, even invited me to his house to meet his wife. He explained to me the history of the region, the costumes of the people, his daily life… and of course he asked me about my own country as well. Probably my favourite question was “how much weight I carry when I’m home”. It made me laugh first, but, of course, it makes sense! After all, over there everyone is always carrying something up or down the mountain. Carrying heavy things up and down has a good advantage. 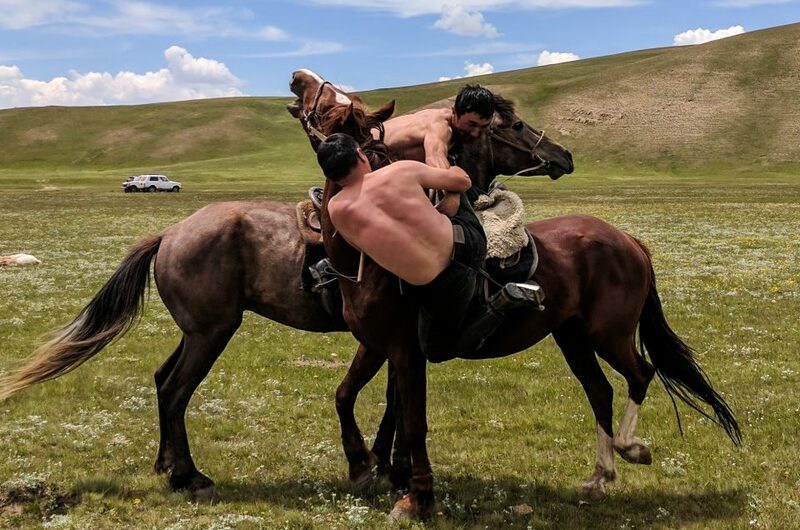 Sherpa people are incredibly athletic. Along the trek, you will be surrounded by other tourists most likely out of breath, exactly like you. Meanwhile, porters carrying insane amounts of weight not only can keep up, some will even walk past you. When I asked Lakpa how much time he needs to do the whole trek, from Lukla to Base Camp, the answer left me speechless. If someone needs him quickly he can do the 65 kilometres in two days going uphill, or 1 day (12 hours) going downhill. 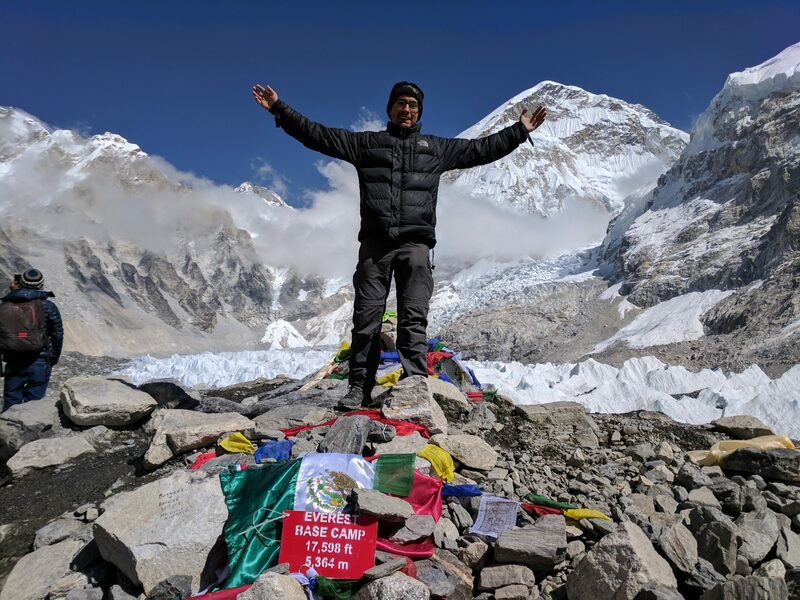 We always hear about famous people conquering the Everest summit, be we often forget that, behind them, there is a porter that does it often, carrying 50 kg of equipment, and can most likely do it quicker alone. Nowadays we are constantly connected, always checking the phone with the latest news. Or checking our email. Or talking to someone. And it can be overwhelming. 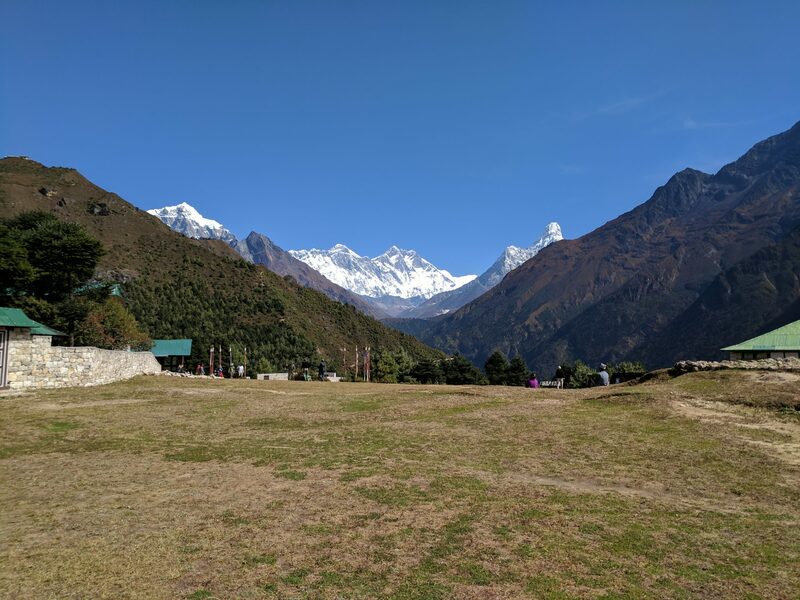 The EBC Trek gives the perfect opportunity to disconnect from everything for about two weeks. While it’s true that up to a certain point you can still find teahouses that offer WiFi, I believe it’s better to just ignore it. You will save money (WiFi is absurdly expensive, and often doesn’t even work), and you will also get peace of mind. For the time you are the only thing in your mind should be getting to the next stop in the way. You will have time to check your hundreds of unread messages once you come back. There is no phone connection here. Or WiFi. Just nature. The Everest Base Camp Trek is definitely a challenge, but even getting to Lukla is a bit of an adventure! The infamous Lukla airport is usually known as one of the most dangerous in the world. Why? Well, for starters the plane you take to go there is tiny, old and, in the one I took, the cracks were fixed with duct tape. Then you have to fly around a bunch of mountains, with often very strong winds that will make you laugh at the regular turbulences. 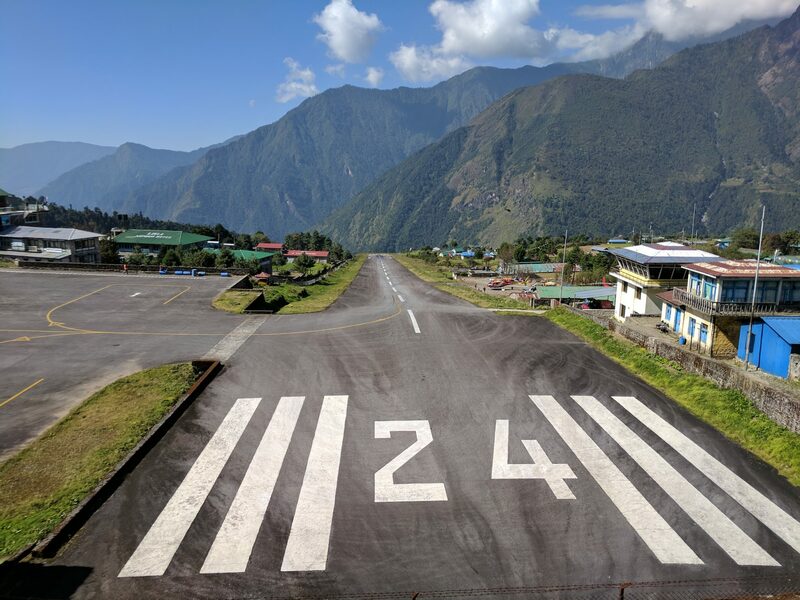 After 45 minutes you finally reach Lukla, and the landing strip of the airport beings to get closer. And this is when the fun begins. It’s a tiny 400-meter strip in the side of a mountain, that makes it look almost like a wall from the plane. And to make things better, it has an actual wall at the end. If the landing it’s too shy and doesn’t make it to the landing strip the plane will fall down the mountain. If, however, it lands too late or the breaks are not good enough, it will crash against the wall at the end. And yes, both scenarios have happened in the past. 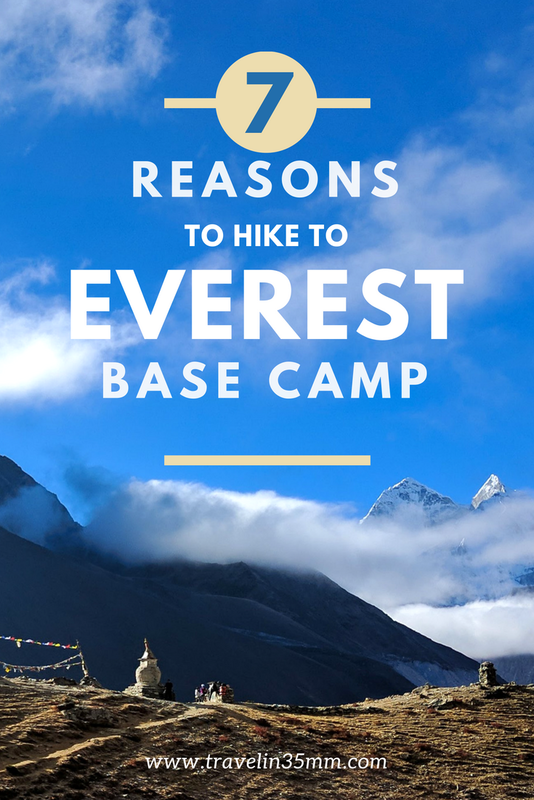 I hope these reasons are good enough for you if you have to chance to do the Everest Base Camp Trek! I truly believe is an unforgettable experience. Even if I only listed a couple of them, there are are many more reasons to do it. Let me know if you are thinking about doing the trek at some point and what are your personal reasons! Or if you already did it, why did you decide to do it? I would love to read about your personal experiences! If you want to know more about the whole experience you can have a look at my photo story, where I describe it day by day with lots of pictures!